I have had this planer for going on 2 years now. I have nothing but praise for it. I got it used but like new condition. to go. The double-sided M2 steel knives are powered by a 15 amp, 120-volt, single-phase motor. cutterhead lock (which eliminates snipe), and easy blade-change. It also includes infeed and outfeed tables, which make it easier to glide your wood through the machine. It max width is 13” and max height is 6 1/2” and a minium of 1/8”. are 2 sided. They basically drop in. Is heavy at about 95 pounds, but that helps keep it in place. The bad is that you have to buy the dust connector for about $30, but you can mount it it in either direction. I have had zero problems and zero snipe. All in all it’s a great buy. with auto power off to save battery. It will display decimal and fractions. ie.. ”.750 3/4”. That looks like a great addition to your shop Gary. Gary I have the next model down from yours – and I also have the Wixey planer gauge on mine. Your review is right on the money – it’s a great little machine (as long as you have DC connected). You sound quite pleased with it. It’s funny, I see some commercial shops going to smaller planners such as yours, and getting rid of the big units, as they take up too much space. I went the other way, and upsized. The first time I used the larger machine, I kept looking around for the rest of the wood. I just couldn’t believe I was finished already. I’ve had the same planer as you guys for just over two years as well…I finally purchased the dust collector attachment last month. It was the last thing on earth I wanted to drop $30 on, but I’m tired of getting on my hands and knees to pick up all the shavings off the floor. However, I don’t have a dust collector. Not sure the shop vac has enough cfm to handle it, nor the holding capacity (this is the reason I pick it all up by hand and only vac what I miss). The planer sure seems to push the chips and dust our pretty forcefully, so I was thinking that just routing a short length of 4” hose into a garbage can could do it. The hose would go directly in the lid with a filtered vent for air to escape but dust and chips to stay put. For those that own this planer, what’s your gut on my silly idea? Thanks for the review Gary – it’s right on. I love this planer and wouldn’t trade it for the Dewalt 735. Of course having missing parts when I first got it was a drag, but Delta had them to me in a week or so, and I could still use it from day one. If I recall it there was no knife tool and the bolts to hold on the handles were missing. At least, that’s what I remember. While I’m at it – do you know where to get a good deal on knives. I meant to stock up a while back when I saw them at Lowe’s in the $30 range, but never did. Of course, they are not an item that Lowe’s stocks any longer and the woodworking outfits want about $50 for the set. The knives are double sided and very easy to change out. I bought the dust chute and added a 90 degree elbow to blow the sawdust into a trash bin. It’s still messy but 99% of the chips end up in the can. The chute works great but will clog easily, especially when planing wet wood, or planing too deeply. You guys are right though with this being one of the best planers I’ve ever used. I’m definately satisfied and would recommend this unit to anyone. Thanx for the great review Gary. Gary, I have the same tool and have used mine for several years w/o any problem. I have planed serveral hundred feet of cherry and maple and only have a minor nick in one of my knives. Today I added a dust collector to it and have the Wixey gauge on order. Your review is right on the money. Dorje, In answer to your question about dust collection I doubt if it would work very well. You are dealing with such a large shavings volume that I am sure it would just clog the hose. I have seen some posts that advise against using a shop vac for dust collection because it just doesn’t have enough pull, not to mention enough volume, to handle this job. But I am going to try it anyway and see if it can work. If it doesn’t then I can always continue to wheel my planer outside or maybe use this as an excuse to buy a legitimate dust collector. 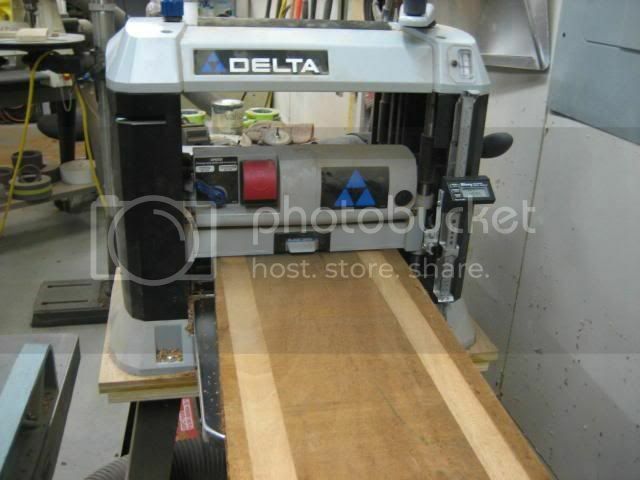 I have had this planer for a couple of years, and I agree—it works great! I haven’t run as much lumber through it as I would like (darn day job), but what I have done comes out beautiful. As to dust collection, I too hated to drop the extra $$$ for the chute, but when connected to my big shop vac (Rigid 12 gal x 5 hp), there isn’t enough dust on the floor to worry about. Yeah, it fills up fairly quickly, but until I can afford a ‘real’ DC system, it’ll do. Doesn’t have the capacity of a DC, but sure beats picking chips up off the floor! Dorje – Makes a big difference, huh? I don’t have this particular planer (I have a DeWalt 734), but until I got a dust collector I used a shopvac attached to the dust chute of the one I have. It worked pretty well, but like Dadoo said if I planed too deeply or planed wet wood, chips went a’flying. Now with the dust collector, post-plane sweeping is at a minimum. GaryK - let’s just say it makes enough of a difference to set it up each time! dH - I’ll have to get a dust collector one of these days!! !